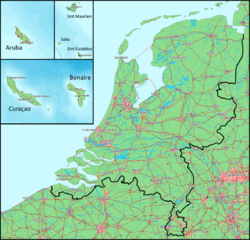 The Netherlands Antilles (Dutch: Nederlandse Antillen, also referred to informally as the Dutch Antilles, was an autonomous Caribbean country within the Kingdom of the Netherlands, consisting of two groups of islands in the Lesser Antilles. Separated by 500 miles, the southern group is comprised of Aruba, Bonaire, and Curaçao (ABC Islands), in Leeward Antilles less than 50 miles off the Venezuelan coast. The northern grouping, Sint Eustatius, Saba, and Sint Maarten (SSS Islands), in the Leeward Islands lie east of Puerto Rico and southeast of the Virgin Islands. Aruba seceded in 1986 as a separate country within the Kingdom of the Netherlands, and the rest of the Netherlands Antilles was dissolved on October 10 2010, resulting in two new constituent countries, Curaçao and Sint Maarten, with the other islands joining the Netherlands as "special municipalities", officially public bodies. The islands were originally discovered and colonized by Spain and came under control of the Dutch West India Company in the 1600s. Due to inadequate fresh water supplies, poor soils, and overgrazing, nearly all consumer and capital goods must be imported. Nonetheless, the island residents enjoy a high per capita income and a well-developed infrastructure as compared with other countries in the region. The economy on the island is fostered by tourism, petroleum trans-shipment and oil refinement on Curaçao, as well as offshore finances. They are famous for beautiful coral reefs and pristine beeches, making them one of the premier locations for divers and vacationers. 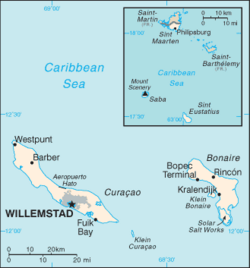 The Netherlands Antilles were comprised of five main (and several smaller) islands in the Caribbean Sea. This island group consists of two chains of islands separated by about 500 miles. The highest point of the islands is Mount Scenery 2,828 ft. (862 meters), located on Saba. in the southernmost portion of the Lesser Antilles, these Windward Islands lie less than 50 miles off the Venezuelan coast, just east of Aruba. Along with Aruba, they are often referred to as the "ABC Islands." Bonaire, including an islet called Klein Bonaire ("Little Bonaire") - 111 square miles (288 sq km), population 14,000 at 2006 census. Curaçao, including an islet called Klein Curaçao ("Little Curaçao") - 171 square miles (444 sq km), population 138,000 at 2006 census. a part of the Leeward Islands in the northern portion of the Lesser Antilles, lying east of Puerto Rico and south of the U.S. Virgin Islands and British Virgin Islands. These are sometimes referred to as the "SSS Islands." Saba - 5 square miles (13 sq km), population 1,424 at 2004 census. 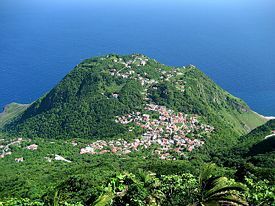 Sint Eustatius - 8.1 square miles (21 sq km), population 2,300 at 2001 census. Sint Maarten; the southernmost part of the island of Saint Marten (the north is administered by Guadeloupe.) 13.1 square miles (34 sq km), population 35,000 in 2006 estimate. The Netherlands Antilles have just over 308 square miles of land and 226 miles of coastlines, with no major lakes or other major water sources. Maritime claims include 12 nautical miles which constitute exclusive fishing zone areas. With a tropical, Caribbean climate, the islands are warm year round. Curaçao and Bonaire are rarely threatened by natural disasters since they lie south and west of the Caribbean hurricane belt. However, Sint Maarten, Saba, and Sint Eustatius are subject to hurricanes from July to October. The northern group of islands are composed of hilly volcanic origins with barren soil and little or no natural irrigation, making agriculture difficult; only 10 percent of the land is considered arable. The southern islands of Curaçao and Bonaire contain bare and eroded soil, the result of overgrazing. Plant life consists mainly of the drought-resistant variety. Natural resources are extremely limited, with phosphates found on Curaçao and salt found on Bonaire. Bonaire is world renowned for its excellent scuba diving and is consistently rated among the top shore–diving locations in the world. The island is ringed by a coral reef which is easily accessible from the shore along the western and southern sides. The entire coastline of the island has been declared a marine sanctuary, preserving local fish life. The island is recognized as one of the best destinations for snorkeling. Also on Bonaire are a great flamingo population and a donkey sanctuary. Goats and donkeys roam the island, descendants of those brought over by the Dutch in the 1500s. Curaçao is a transcontinental island that is geographically part of South America, though considered to be part of the Caribbean. Its climate, geology, flora and fauna are more akin to Venezuela. Scrublands are common, with various forms of cacti, thorny shrubs, and evergreens. The island is renowned for its coral reefs which make it an excellent spot for scuba diving. The beaches on the south side contain many popular diving spots. An unusual feature of Curaçao diving is that the sea floor drops off steeply within a few hundred feet of the shore, and the reef can easily be reached without a boat. This drop-off is locally known as the "blue edge." Strong currents and lack of beaches make the rocky northern coast dangerous for swimming and diving, but experienced divers sometimes dive there from boats when conditions permit. The southern coast is very different and offers remarkably calm waters. The coastline of Curaçao features many bays and inlets, many of them suitable for mooring. Saba's environment is mainly composed of woodland forest with ferns and damp soil, and many mango trees. There were once forests of Mahogany until they were almost completely devastated in a 1960s hurricane. The remaining Mahogany trees are considered at risk of extinction. The island's forest has been nicknamed "the Elfin Forest" because of the high altitude mist and mossy appearance. A woodland reserve has been created and aptly named "Elfin Forest Reserve." Saba's lush plant and animal wildlife are diverse and are looked after by the Saba Conservation Foundation. Sint Eustatius is known for its world class diving, due to pristine coral reefs, abundant marine life and historic shipwrecks. Fish life is abundant. A number of rare species, such as the flying gurnards, high hats and jack-knife delight visitors. Rare fauna and flora, abundant marine life and national parks offer an attraction for tourists. Sint Maarten borders the French overseas collectivity of Saint-Martin, which occupies the northern half of the island. Known as the smallest island in the world ever to have been partitioned between two different nations, the island has been shared by the French and the Dutch for nearly 350 peaceful years. Though the border between the two is almost imperceptible, each side has maintained the distinctiveness of its own national culture. While the beaches on the French side are secluded, Sint Maarten has developed a busy cruise port and bustling commercial district and has an active trade and tourism industry. The Netherlands Antilles were initially inhabited by Arawak and Carib Indians. As with most of the native Caribbean Island populations, the arrival in the early sixteenth century of Europeans caused the decimation of the native population through disease and the rigors of forced labor. American University of the Caribbean on Sint Maarten. This was the first of the islands of the Netherlands Antilles to be sighted by Europeans, discovered by Christopher Columbus on Nov. 11, 1493 (St. Martin's Day, hence the name). In 1638 French pirates took control of the island, though by 1640 the Spanish began settling there. Spain left by 1648, at which time the island was amicably divided by Dutch and French prisoners of war. The French claimed a large northern section of the island. A smaller southern section went to the Dutch. The southern section proved to be more valuable due to large salt deposits. This island was also discovered by Colombus in 1493. It was first colonized by the French and English in 1625, and was taken by the Dutch in 1632. Throughout a swaggering colonial era that followed, the island changed hands at least 22 times. In 1678 the Dutch West India Company stationed a commander on Sint Eustatius who also governed over the islands of Sint Maarten and Saba. At the time, the island was of some importance for sugar cultivation. The island was also home to one of the first Jewish settlements in the New World, dating back at least to the early eighteenth century. The Honen Dalim Synagogue, built in 1739, now stands in ruins. Depiction of the famous flag incident on Sint Eustatius. Since the island sold arms and ammunition to anyone willing to pay, the island was one of the few ways for the rebellious thirteen colonies to obtain weaponry. This good relationship between Sint Eustatius and the United States resulted in the famous "flag incident" of November 16, 1776, when Commander Johannes de Graaff of Sint Eustatius decided to return the salute fire of the visiting American brigantine Andrew Doria. The United States gave the answering salute great publicity because the salute was the first international acknowledgment of the independence of the United States. The British did not take the incident too seriously, although they protested against the continuous trade between the United States and Sint Eustatius. In 1778, Lord Stormont claimed in Parliament that, "if Sint Eustatius had sunk into the sea three years before, the United Kingdom would already have dealt with George Washington." The trade between Sint Eustatius and the United States was the main reason for the Fourth Anglo-Dutch War, which was disastrous for Dutch trading. As a result of the war, Sint Eustatius was taken by the British on February 3, 1781. Commander de Graaff, surrendered the island to the British Admiral Rodney. Ten months later the island was conquered by the French, allies of the Dutch in this war. The Dutch regained command over the island in 1784. The island never regained its trade. In the seventeenth and eighteenth centuries most of the land was under sugarcane production. At its peak, the island may have had a population of over 20,000 people. Eventually Sint Eustatius was eclipsed by other Dutch ports on Curaçao and Sint Maarten and its population decreased considerably. 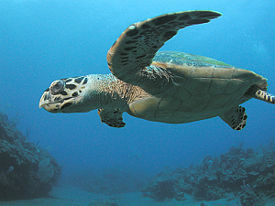 Hawksbill Turtle near Saba Island. It is believed that Christopher Columbus sighted Saba on November 13, 1493, but did not land, as the island's perilously rocky shores were a major deterrent to Columbus and his crew. In 1632 a group of shipwrecked Englishmen landed on Saba. In 1635 a Frenchman claimed Saba for Louis XIII of France and around the year 1640, the Dutch West India Company sent people from the neighboring island of St. Eustatius to colonize the island. These settlers were evicted to Sint Maarten in 1664 by Sir Henry Morgan, the notorious English buccaneer, on one of the very few occasions that the nearly vertical rocky island was successfully invaded. The Netherlands finally took possession of Saba in 1816 after a spell of British occupation during the Napoleonic era. In the 1600s Saba was believed to be a favorable hideout for Jamaican pirates. England also deported its "undesirable" people to live in the Caribbean colonies. They too became pirates, taking haven on Saba. The most notable native Saban pirate was Hiriam Breakes, who famously quipped "Dead Men Tell No Tales." Legitimate sailing and trade later became important and many of the island's men took to the seas, during which time Saba lace became an important product made by the island's women. During the seventeenth and eighteenth centuries the island's major industries were sugar and rum, and, later, fishing, particularly lobster fishing. The remains of the 1640 settlements can be found on the west side at Tent Bay. Dutch architecture along Willemstad's harbor, Curacao. Discovered in 1499 by Alonso de Ojeda and Amerigo Vespucci. It was not settled until 1527, when Spanish settlers began to raise livestock there. The Dutch West India Company, led by Johannes van Walbeeck, occupied the island in 1634, fortifying it for use as a commercial center and trade base. The first profitable industry established on Curaçao was salt mining. The island thrived throughout the 1700s, and was a major base for the slave trade during the period of colonization. During the eighteenth and nineteenth centuries, the island changed hands among the British, the French, and the Dutch several times. Stable Dutch rule returned in 1815, at the end of the Napoleonic Wars. The Dutch abolished slavery in 1863, which caused economic hardship and prompted many inhabitants of Curaçao to emigrate to other islands, such as to Cuba, to work in sugarcane plantations. In the nineteenth century, phosphate mining became significant. Oil was discovered in the Maracaibo Basin town of Mene Grande in 1914, and the fortune of the island was dramatically altered. An extensive oil refinery installation was built on the former site of the slave-trade market at Asiento, creating an abundant source of employment for the local population and fueling a wave of immigration from surrounding nations. 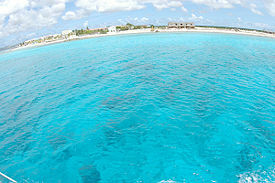 The clear water of Bonaire. Bonaire was also discovered in 1499 by Ojeda and Vespucci and settled by Spain in 1501. Under Spanish occupation, the natives were enslaved and transported to Hispaniola, but the island's natural resources were largely ignored. By 1526, the island was depopulated. That year, Juan de Ampues, regional governor, turned it into a cattle plantation and repopulated it with Indians. In 1633, the Dutch, having lost the island of Sint Maarten to the Spanish, retaliated by capturing Curaçao, Bonaire, and Aruba. While Curaçao emerged as a center of the slave trade, Bonaire became a plantation of the Dutch West India Company. A small number of African slaves were put to work alongside Indians and convicts, cultivating dyewood and maize and harvesting salt around Blue Pan. Slave quarters, rising no higher than a man's waist and built entirely of stone, still stand in the area around Rincon and along the saltpans as a grim reminder of Bonaire's repressive past. The Netherlands lost control of the island twice, from 1800-1803 and 1807-1815. During these intervals, the British had control over the neighboring island of Curaçao, and, by extension, Bonaire. During the German occupation of the Netherlands during World War II, Bonaire was a protectorate of Britain and the United States. In 1954, the status of islands was promoted from that of a colonial territory to part of the Kingdom of the Netherlands as an associated state within a federacy. The island of Aruba was part of the Netherlands Antilles until 1986, when it was granted status aparte, becoming a self-governing state of the Kingdom of the Netherlands. Of the islands, Sint Maarten and Curaçao voted for status aparte. Saba and Bonaire voted for closer ties to the Netherlands. Sint Eustatius was the only island to vote to remain with its current status in the Netherlands Antilles. On 26 November 2005, a Round Table Conference (RTC) was held between the governments of the Netherlands, Aruba, the Netherlands Antilles, and each island in the Netherlands Antilles. The final statement to emerge from the RTC stated that autonomy for Curaçao and Sint Maarten, plus a new status for Bonaire, Saba and Sint Eustatius would come into effect by 1 July 2007. On 12 October 2006, the Netherlands reached an agreement with Saba, Bonaire and Sint Eustatius; this agreement would make these islands special municipalities. On 3 November 2006, Curaçao and Sint Maarten were granted autonomy in an agreement, but this agreement was rejected by the then island council of Curaçao on 28 November. The Curaçao government was not sufficiently convinced that the agreement would provide enough autonomy for Curaçao. 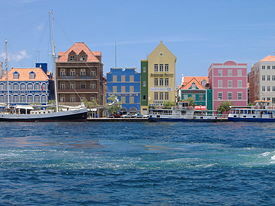 On 9 July 2007 the new island council of Curaçao approved the agreement previously rejected in November 2006. A subsequent referendum approved the agreement as well. The acts of parliament integrating the BES islands (Bonaire, Sint Eustatius and Saba) into the Netherlands were given royal assent on 17 May 2010. After ratification by the Netherlands (6 July), the Netherlands Antilles (20 August), and Aruba (4 September), the Kingdom act amending the Charter for the Kingdom of the Netherlands with regard to the dissolution of the Netherlands Antilles was signed off by the three countries in the closing Round Table Conference on 9 September 2010 in The Hague. Map of the Kingdom of the Netherlands. The Netherlands and the Caribbean islands are in the same scale. The ruling monarch of the Netherlands was the also the head of state in the Netherlands Antilles, who is represented by a governor. The governor was the head of the local government, and forms, together with the council of ministers, the executive branch of the government, much like the United States government. The legislative branch was a two-layered system. Delegates of the islands were represented in the government of the Netherlands Antilles, but each island had its own government that took care of the daily tasks on the island. The islands had no major administrative divisions. The Netherlands Antilles were not part of the European Union. The economy on the islands is fostered by tourism, petroleum trans-shipment and oil refinement on Curaçao, as well as offshore finances. The islands enjoy a high per capita income and a well-developed infrastructure as compared with other countries in the region. Almost all consumer and capital goods are imported, with Venezuela, the United States, and Mexico being the major suppliers, as well as the Dutch government which supports the islands with substantial development aid. Unfortunately poor soils and inadequate water supplies hamper the development of agriculture. The Antillean "guilder" has a fixed exchange rate with the United States dollar of 1.79:1. A view from the summit of Mt. Scenery, the highest point on Saba Island. A large part of the Netherlands Antilleans descend from European colonists and African slaves. The remainder of the population originates from other Caribbean Islands, Latin America, East Asia and elsewhere. Most Netherlands Antilleans are Dutch citizens and this status permits and encourages the young and university-educated to emigrate to the Netherlands. This exodus is considered to be to the islands' detriment as it creates a "brain drain." On the other hand, immigrants from the Dominican Republic, Haiti, the Anglophone Caribbean and Colombia have increased their presence in recent years, offsetting the emigration. Papiamentu is predominant on Curaçao and Bonaire (as well as the neighboring island of Aruba). The creole used here descends from Portuguese and West African languages with a strong admixture of Dutch, plus subsequent lexical contributions from Spanish and English. In early March 2007, after decades of debate, English and Papiamentu have been made official languages alongside Dutch. Legislation is produced in Dutch but parliamentary debate is in Papiamentu or English, depending on the island. Due to the islands' proximity to South America, Spanish is becoming increasingly known and used throughout the archipelago. The majority of the population are followers of the Christian faith, mostly Roman Catholic. Curaçao also hosts a sizable group of followers of the Jewish faith, since descendants of a Portuguese group of Sephardic Jews arrived from Amsterdam and Brazil in 1654. The culture of the Netherlands Antilles bears the influence of its early settlers. Tourism and overwhelming media presence from the United States has also influenced the islands' culture. On all the islands, the holiday of Carnival is, like in many Caribbean and Latin American countries, an important one. Festivities include "jump-up" parades with beautifully colored costumes, floats, and live bands as well as beauty contests and other competitions. Carnival on the islands also includes a middle-of-the-night j'ouvert (juvé) parade that ends at sunrise with the burning of a straw King Momo, which is believed to cleanse the island of sins and bad luck. ↑ Landsverordening officiële talen. wetten.nl (28 March 2007). Retrieved November 21, 2011. ↑ Netherlands Antilles Coral Reef Initiative. July 2007. Netherlands Antilles Coral Reef Initiative Retrieved October 22, 2007. ↑ Status change means Dutch Antilles no longer exists. BBC News. BBC (10 October 2010). Retrieved November 28, 2011. ↑ Closing statement of the first Round Table Conference. Ministry of the Interior and Kingdom Relations (26 November 2005). Retrieved November 28, 2011. ↑ Radio Netherlands (12 October 2006). Caribbean islands become Dutch municipalities. Retrieved February 2, 2007. ↑ "Curaçao and St Maarten to have country status", Government.nl, 3 November 2006. Retrieved January 21, 2008. ↑ Curaçao verwerpt slotakkoord. Nu.nl. Retrieved November 28, 2011. ↑ The Daily Herald St. Maarten (9 July 2007). Curaçao IC ratifies November 2 accord. Archived from the original on 11 July 2007. Retrieved July 13, 2007. Netherlands Antilles US Department of State. 'Antilles Break-Up Closer' Article. BBCCaribbean. This page was last modified on 16 November 2018, at 16:28.